Visit Phoenix bolsters its tourism and travel trade efforts with promotion and new hire; the tourism department markets Greater Phoenix to the domestic and international leisure travel market, primarily through tour operators and travel agents. Tourism veteran Maria Lourdes Delgado has been promoted to director of tourism. Delgado has played an integral role in creating strategic partnerships and elevating Phoenix’s presence in the Mexico market. In her new role, she will spearhead tourism efforts with trade partners and marketing destination attributes available for their clients in the Greater Phoenix area, including accommodations, dining, transportation and activities. She has been with Visit Phoenix for 12 years and is a key asset to the team. George Herrera joins the team as tourism manager. Herrera will be responsible for the Domestic and Canadian markets for travel trade. Beginning his hospitality career in Phoenix, he brings over 10 years of experience in the industry working for Hilton’s Waldorf Astoria Collection, Salt-River Pima Maricopa owned and operated Hotel & Casino, and Starwood Hotels & Resorts before joining Visit Phoenix. 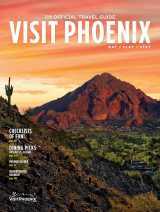 Visit Phoenix is a not-for-profit organization that markets Greater Phoenix as a travel and meetings destination, and serves as the primary booking agent for the Phoenix Convention Center.